Lenzie achieved a welcome 10-0 victory at a wet and muddy Viewfield on Saturday against an organised and competent Strathaven side. From the kick-off Lenzie went on the offensive and they were rewarded with an early Shearer try when Patterson and Fraser combined well to release the flying winger. Brodie missed the conversion from close range. Lenzie continued to apply pressure on the visitors’ line and scored an excellent forward try from a great take from a Mckenzie at the lineout. Brodie missed the conversion once again. Similar to last week, the game entered another bizarre period where decision making from all sides could have been better which hampered the flow of the game and the heavy ground conditions were also a contributing factor. The home side can consider themselves very unfortunate to receive the only yellow card of the game for an innocuous free kick offence. However this allowed the inexperienced Le Mar to make his debut at prop and the youngster put in a promising performance. 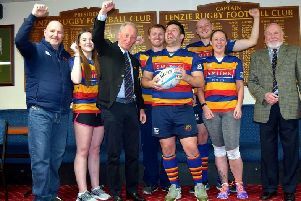 Strathaven enjoyed better field position in the second period but failed to threaten Lenzie’s try line until the final minutes where the home side defended well to hold out for the win. This was a frustrating game for both sides; however Lenzie were delighted to collect the league points following their run of narrow defeats in the past few weeks. Best for Lenzie were Williams, Letford, McCrae, McWilliams and Fraser with Craig Bryson being the man of the match for the home side. There is no game for Lenzie next week as their opponents Paisley are playing in the Regional Shield Competition. Lenzie 2s play Annan at Viewfield, kick-off 3pm.